When Colombia’s government and FARC guerrillas negotiated a deal to end the hemisphere’s longest armed conflict, they also took an unprecedented step toward a more productive and reasonable drug policy. They argued that building peace in the world’s greatest cocaine producing country would require a “new” and “permanent solution” to the drug problem–not the hard-hitting, Narcos-style method of taking down cartel “Capos” ad infinitum, but a more sustainable and human rights-based approach that hits at the core of drug production: the farmers. Large swaths of Colombia’s rural territories are covered in coca, the base ingredient of cocaine. The plant itself is harmless, and many use it to make herbal teas or as a natural energy supplement. But when mixed with gasoline, cement, and a host of other chemicals, coca becomes white-colored gold. In spite of its value, the majority of Colombian farmers who grow the base ingredient for cocaine are poor. Many belong to ethnic minorities inhabiting portions of the country that have never seen a government presence. They lack basic infrastructure like roads, schools, hospitals, and plumbing. Rather than planting a legal crop like cacao or coffee, and then struggling to take it to market without the infrastructure to do so, many farmers in remote regions have chosen to plant coca instead. It’s a durable crop that grows in a variety of environments, and drug traffickers will pay a nice sum to come pick it up and whisk it away. As part of the US-backed “War on Drugs,” Colombian authorities used to directly target and sanction poor coca farmers. They jailed those growing coca, and they initiated a public health crisis using airplanes to spray a likely carcinogenic herbicide over thousands of acres of farmland. Since initiating a peace process with the FARC rebel group, Colombia has tried to back away from the repressive “War on Drugs” approach that punished poor coca farmers. Recently the government launched a national crop substitution program, for example, offering small coca farmers up to $12,000 over a two-year period as well as technical support, improved protection from drug traffickers, and investment in their communities in exchange for voluntarily tearing up their coca plants. Any farmers that don’t participate in the program may have their crops removed by force. The idea is that farmers with infrastructure, security, and an added cash incentive will be able to transition away from coca toward other, legal crops. On paper, the program is highly laudable. It recognizes farmers’ plights, invests in their communities, and features a reasonable two-year timeline to seek positive results. Just as Colombia launched the substitution system, pledging to have 50,000 hectares of coca voluntarily removed by the end of the year, the government–under pressure from the US and the UN–also promised to eradicate an additional 50,000 hectares of coca by force, without farmers’ consent. Since then, there have been at least twenty-two violent clashes–multiple in every coca-rich region of Colombia–between police and farmers. In the majority of instances, coca growers participating in the substitution program, or those who have expressed an interest in doing so, are combatting police officers who ignore substitution agreements and continue to pull up their coca. The violent clashes have resulted in multiple deaths, countless injuries, and thousands of coca farmers losing trust in their government to honor the substitution agreements. What was supposed to be a sustainable human-rights based approach is now another War on Drugs painted in a different light. When the government announced its new approach to eliminating coca cultivations in Colombia, it was clear that coca farmers would benefit from the program. Now, coca farmers find themselves stuck between a rock and a hard place, at odds with police who want to eradicate their crops and violent armed groups who want them to keep planting. In an incident that reflects farmers’ situations across the country, anti-narcotics police last week killed at least six farmers during a coca protest in Tumaco, Nariño. The event follows countless others around the country in which members of the anti-narcotics police, anti-riot police, and the military have acted violently toward farmers while disregarding agreements made within the national crop substitution program. At the same time, credible sources reported that illegal armed groups in the region threatened and pressured farmers in Tumaco to attend the protest that turned deadly. That also reflects the situation across the country, as farmers and community leaders face consistent threats from armed groups not to participate in the national crop substitution program. Meanwhile, the administration of President Juan Manuel Santos, originally lauded for its new approach to tackling coca, is getting terrible PR. Members of the domestic and international community have repeatedly criticized the government for its poor rollout of the crop substitution program and for the faulty coordination between the program and the police, as well as the latter’s use of excessive force. At its current rate the government is also unlikely to meet its promise to remove 100,000 hectares of coca by the end of the year. 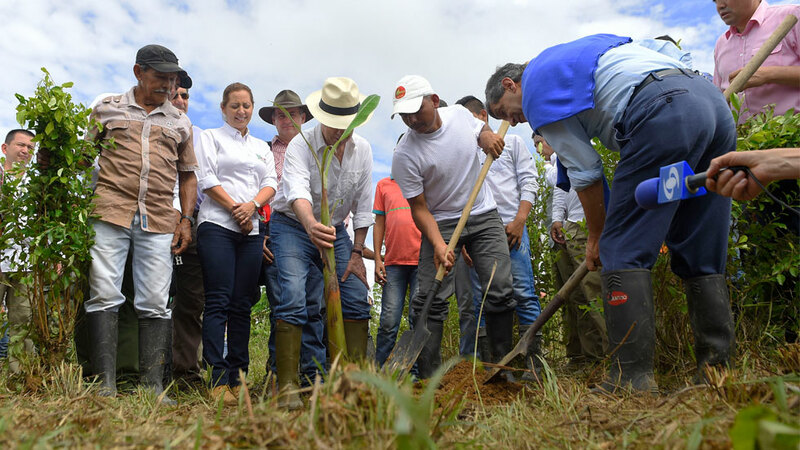 As Colombia Reports stated last month, only about 7,500 families are actively engaged in the crop substitution program, which amounts to approximately 6,500 hectares of the 50,000 goal. And the recent violence by anti-narcotics police is not going to inspire more farmers to join the program. The only clear winner in Colombia’s new, faulty drug paradigm is the United States. These kinds of statements, which go directly against the spirit of the peace accord with the FARC, reflect the US position on coca cultivation in Colombia. The US has long disregarded the plight of poor coca farmers, instead promoting drug policies that, on the contemporary global scale, are considered old fashioned, counterproductive, and at worse, abusive. Nonetheless, the US has continued to successfully push its anti-supply chain agenda on Colombia, managing to hold foreign aid funding over the country’s head unless the government engages in stricter, more repressive policies like forced eradication. Colombia’s “new solution” to the drug problem, outlined in Point Four of the Final Peace Agreement with the FARC, has the potential to be a great success. Given the proper amount of time, resources, and adherence to the language of the agreement, the national crop substitution program can help farmers overcome their reliance on coca, improve the security situation in rural regions, and promote prosperity across the country. But that means the government needs to get serious about supporting farmers. It needs to protect them from illegal armed groups rather than focusing the security resources on the unpopular and violent coca eradication squads. It also means the government needs to stand up for the merits of its new solution rather than submitting to the pressure of foreign states to meet unrealistic coca eradication goals. When the Colombian state improves those conditions in a peaceful, sustainable, and patient manner, coca cultivations will disappear and small-time farmers will prosper.